Ben Robinson, an internationally acclaimed magician, will present a live magic show on December 10 as part of the Magicians on Screen program at the Museum of the Moving Image. The following piece by Robinson is adapted and reprinted, with permission, from a 2002 article published in The Keaton Kronicle, the magazine of the International Buster Keaton Society, The Damfinos. 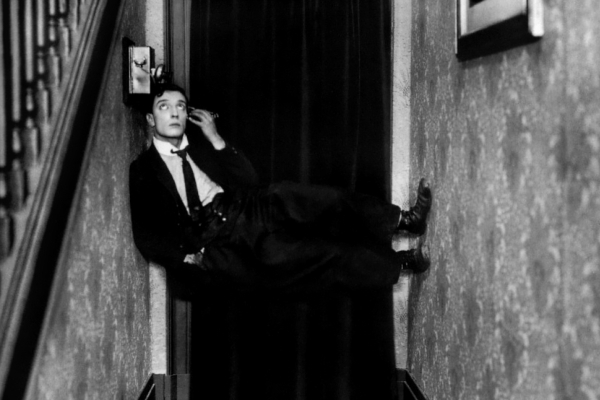 Buster Keaton was an illusionist. It is said that the world's greatest illusionist, or magician, would never be truly known by the public at large. Why? Because so great a "talent" wouldn't need the adulation, as the prowess that made the work possible would be best displayed by not even being seen. In the shadows of show business and art, there would lie success. In the French this is referred to as "eminence grise." While Buster is certainly known, his use of illusion is best appreciated as an auxiliary component to the "gag." However, Buster's upbringing and fantastic vaudeville education clearly expresses itself in his movies, some of his TV appearances and more notably, when meeting the media. It might be assumed that the Keaton we see is an image he is in total control of. But that controlled image was one of a surreal world where "magic" was part of the landscape, like air. In the famous Sid Avery photograph of Keaton, titled "What Elephant?" in which Keaton looks forward, with his hand on his brow, the elephant's trunk winds through his other arm, the pachyderm quietly standing behind the comedian. This is a vanishing elephant only to the person closest to the king of the forest, a good metaphor for Keaton's "magic." 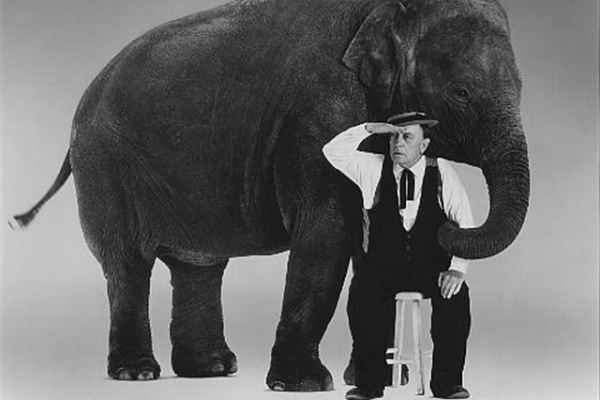 Buster Keaton in the photograph titled "What Elephant?" Legend has it that Buster received his nickname from Houdini. While this may be a matter of conjecture, the legend sticks (and most vaudevillians would tell you that when it comes down to printing the myth or the truth, they yowl, "The myth, print that!"). That Joe Keaton and Harry Houdini (1874-1926) once appeared before the audiences of the Midwest in a tent show is certainly a fact. It is also a fact that this show, "The Keaton-Houdini Medicine Show" was not a great success, and occurred years before Houdini's triumph in Europe in 1900. Of his father, Keaton remarks that "he was an eccentric dancer, not an acrobat, but damn near." The same might be said of Keaton: he wasn't a magician in the classic sense, but damn near. Like a classic magician, everything that he saw, particularly of the mechanical variety, was always filed away in his memory for future use. His summer home amid the actor's colony in Muskegon, Michigan, was not far from a little town named Marshall, which among its distinctions was the home of the very first electrified house in the U.S. Called Honolulu House, it doesn't have the electric stair case (escalator) Buster later used in The Electric House, but it does have the sliding bathtub that switches between rooms, among many other mechanical wonders. Backstage, Buster saw it all. He refers to using some of Houdini's tricks in his movie Sherlock Jr., and even opens Cops with a line credited to Houdini: "Love laughs at Locksmiths." He also acknowledges a relatively little-remembered genuine Chinese vaudeville illusionist, Ching Ling Foo—whose grand feats included turning a somersault in mid air and then returning to a standing position, holding a bowl of goldfish that had appeared from nowhere! Young Buster grew up learning that magic had to be "justified" or plausible for the introduction of an illusion. He realized in his movie-making career that "cartoon or impossible" gags (and illusions) had to be justified, like his jumping and impossibly disappearing into the brief case held by a male accomplice dressed as a woman (Sherlock Jr.) or appearing as nine dancers on stage all in time (The Playhouse) or avoiding the tornado winds by hiding in a magician's prop (Steamboat Bill Jr.). As Keaton put it: "I always want the audience to out-guess me, and then I double-cross them." Keaton's use of illusion was not always as a trick per se. When the house he moves across the train tracks in One Week narrowly escapes destruction by an oncoming train, another train enters the frame—and his on-screen drama—and demolishes what we thought, only seconds before, was safe. Similarly a magician will make a scarf appear, only to have the audience relax at that manifestation. When a dove flutters from the folds of that scarf, there comes the "topper." Buster just played with much larger props. This type of drama, although small, is as much of the conjurer's lexicon as a rabbit and a hat. Magicians refer to this type of presentation as a "sucker gag." Feigned failure, only to be consummated by winning success, or in the previous example, unexpected total destruction. 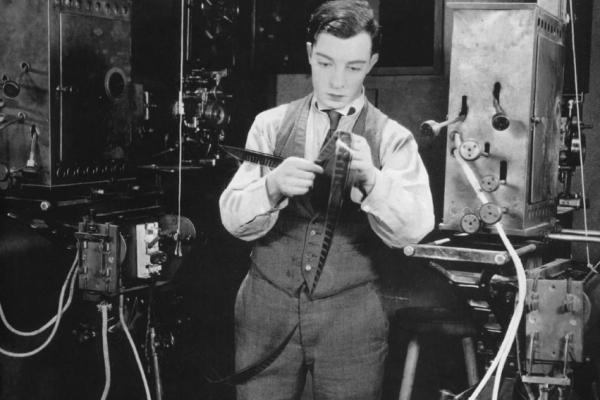 Buster Keaton in Steamboat Bill, Jr.
Buster was schooled in such thinking about surprise (both magic and comedy being dependent on surprise) by his vaudeville and mud show upbringing. The magician's technique he learned as a child pervaded his work onscreen and elsewhere. Onstage in France, in the late 1940s, he counseled the clowns in the Cirque Medrano on how to get more out of the crowded clown car gag. Multiple large clowns (always ending with the largest of all) simply emerging from a small vehicle was impossible. Once Keaton showed them how the impossibility became surprising, then the illusion became magical, funny, and even more surprising. How many times have we all seen this? And how many times have we seen the clowns emerge with beach chairs and finally a clown emerging with a full tray of food including a stuffed turkey? These were touches Keaton culled from the Hanlon Bros. performance of clowning, magic, and illusion that took place in Europe and the U.S. prior to 1900. And now for the magic that hits you as reality. This may give you an example of Buster's eminence grise. Remember the famous scene in Sherlock Jr. where Buster is "shadowing" a man walking in front of him? Now, watch as the man tosses a cigarette behind him, which Buster catches, takes a drag of and then discards...or does he? Given that Buster is the fellow who had a whole side of a building fall around him, missing him by mere inches, I think handling a lighted cigarette in flight was child's play for him. But slow down the image and you will see a nifty sleight of hand he no doubt executed on many occasions, being an inveterate smoker. Other hand magic: in The Cameraman Buster tried to catch the fancy of the photo assignment secretary by making a quarter disappear in his hand, only to be revealed from behind his ear. 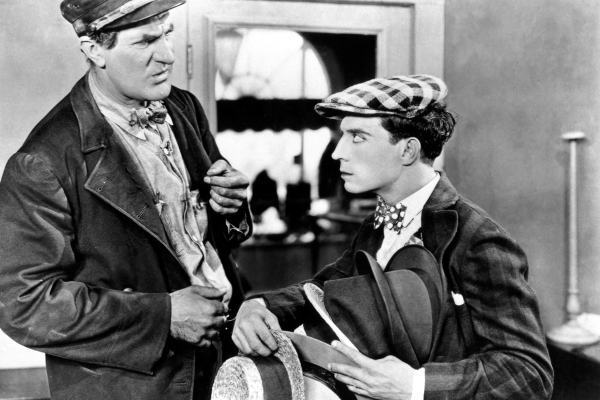 In Steamboat Bill Jr., when attempting to have his father receive a loaf of bread in jail, Buster mimes the contents of the bread involving another deception of the hands. Effortlessly. Gracefully. As if he yawned. All magical illusions are understood by the student of the art, firstly through small, handheld deceptions. Buster likely combined his consummate understanding of the nature of the film medium and his familiarity with the backstage scene where magicians show each other tricks they carry with them, at one time known as "vest pocket magic." Buster understood close-up magic because he was schooled in close-up from day one. Buster Keaton in Sherlock Jr. Whether it was dangling from a rope to save his wife from a raging waterfall (à la Houdini) in Our Hospitality or making it appear as if he simply caught a lighted cigarette from the air, Keaton saw the meshing of illusion and reality in every situation, and exploited it. While performing offstage for a visiting film crew, in his later years, he created the illusion of catching a train, and bringing a 10-ton locomotive to a halt. One might say this was a developed version of catching the side of a moving car and being whisked from view, as in one of his short comedies. Jack Flosso, the late owner of the world's oldest magic shop (see www.martinka.com) knew Keaton remotely through his father, the great Al Flosso, veteran of thousands of vaudeville and Coney Island sideshow performances. Flosso says, "When you do magic and don't admit it, that's great. Harpo did that, and where'd ya think he got that...Keaton! Buster had an eye for everything. Remember that." That Keaton's silent, surreal illusions should find a home in the 1930s amid Harpo's arsenal of wonders is not surprising to any Keaton scholar. What is delightful is that Keaton's use of illusion was an integral part of his day-to-day life. He frequently polished a window near him only to surprise his viewers by putting his head through the glass he had just polished, revealing that his polishing was deft pantomime, and the illusionary glass was only perceived as solid by his impromptu audience. Many remark what a great practical joker he was. Such visual jokes have their roots in illusion. In several newsreels depicting Buster at play one finds Keaton doing something short and sweet like sewing his fingers together (later adopted by Red Skelton) or making a baseball disappear for a dog (but not for the rest of the audience). Anything surprising, anything out of the ordinary from this apparently "ordinary" man made his magic more memorable and surprising. We always hear of the "magic of the movies." Buster Keaton is a master of a special type of movie magic that, often, you don't even realize is right in front of you. Beckett, Samual., FILM, Grove Press, NY 1969. Bengtson, John., Silent Echoes (Discovering Early Hollywood Through the Films of Buster Keaton), Santa Monica Press, CA 2000. Blesh, Rudi., Keaton, The Macmillan Company, New York, NY 1966. Dardis, Tom, KEATON - The Man Who Wouldn't Lie Down, Limelight Edition, 1996. Kerr, Walter., The Silent Clowns, Da Capo Press, NY 1975. Keaton, Buster with Charles Samuals., My Wonderful World of Slapstick, Doubleday & Co., NY 1960. Kline, Jim, The Complete Films of Buster Keaton, Citadel Press, NY 1993. Knopf, Robert., The Theater and Cinema of Buster Keaton, Princeton University, Press, NJ 1999. Meade, Marion., Buster Keaton Cut to the Chase., Harper Collins, NY 1995. Tobias, Patricia Eliot, Ed., The Great Stone Face, The Magazine of the Damfinos, The International Buster Keaton Society, Volume 1, 1996. Interview with Jack Flosso in New York City, December, 1999. Kevin Brownlow, & David Gill (producers) Keaton—A Hard Act to Follow, Thames TV production, 1987. Ben Robinson is an award-winning writer and historian whose written for TV, books for magicians, and the chronicle of his trek to the base camp of Mt. Everest.